Aragon Photonics at ECOC 2016 - Aragon Photonics Labs. 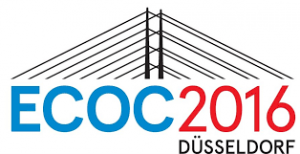 Aragon Photonics was exhibiting at ECOC 2016 on September 19-21 in Düsseldorf, Germany. Visitors could see the new and amazing BOSA 400 and the great-balanced BOSA Lite performances, including the new software utilities and capabilities. We want to thank all the visitors their time and consideration for coming by our booth. Hope to see you very soon!